On the eve of the apparitions of Our Lady, Lourdes was just an ordinary little Pyrenean town, with 4,135 inhabitants. Overshadowed by its fortress, Lourdes was the district's administrative centre. To the east, the waters of the Lapaca powered five mills. It was in Boly Mill, in july 1841, that events took a dramatic turn. The miller, Justin Castérot, died, leaving his widow, Claire, alone with four girls and a little boy. A man was needed to run the business. François Soubirous, an employee in a neighbouring mill, was invited to court the eldest girl, Bernade. François, however, fell for the youngest, Louise. Married on january 9th, 1843, the young couple moved into the Castérot's mill. On january 7th, 1844, Louise gave birth to Marie-Bernarde who soon become known as Bernadette. The baby was baptised two days later in the parish church. But then, in November, Louise suffered a candle burn to her breast and, unable to feed her baby, placed Bernadette with a wet nurse, Marie Laguës for eighteen months. In 1846, the family celebrated the birth of Toinette. Two years later, Claire Castérot left the mill, and went to live with her eldest daughter, leaving François to work the mill alone. Ill versed in economic realities, François soon got into debt. On june 24th, 1854, unable to meet the payments on the mill, the Soubirous were forced to leave. In 1855, an outbreak of cholera claimed thirty-eight victims and left Bernadette with chronic asthma. Claire Castérot died and, using the small inheritance she left, the Soubirous left Baudéan Mill and rented another, on better terms, at Arcizac. But the harvests that year and the next were bad, and Lourdes was struck by famine. Ruined, and by now with two more young children to feed, the family moved into a "miserable shack" at Rives House. François became a day labourer, Louise did whatever odd jobs she could get, the older children collected bones and scrap iron, and Bernadette went to work at her aunt's inn. 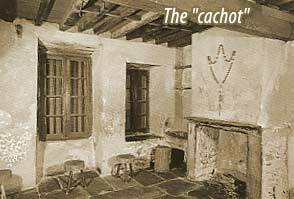 Unable to pay the rent, evicted and homeless, the family moved to the "Cachot". On March 27th, 1857, François was arrested for stealing flour. Although proved innocent and released a week later, he could not find work. 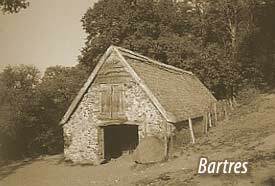 In September, to make "one less mouth to feed", Bernadette went to work for her old wet nurse at Bartrès. But she was homesick, and life there was hard, so her parents decided that she should return to Lourdes. On January 21st, 1858, Bernadette came home to the "Cachot", and began attending the paupers' class at Nevers Convent School.